Jun 10 - Representatives of Friends of the River (FOR) San Bernard attend the first meeting of the Gulf Coast Ecosystem Restoration Council in Galveston, Tx. President Wayne Head spoke about reopening the mouth and delivered a booklet of information and photos regarding the closure to the Restoration panel. The Restoration Council is responsible for distribution of federal civil penalties resulting from the Deepwater Horizon oil spill ligation. 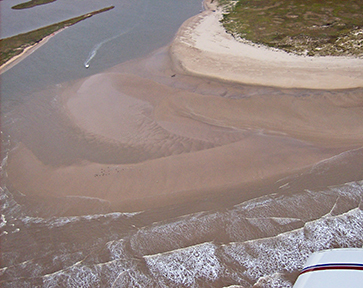 Feb 25 - Brazoria County Commissioners unanimously vote to hire Dannenbaum Engineering to begin preparation of a grant application for RESTORE Act funds to dredge open the mouth and build protective jetties to keep it open. This ad appeared in the Feb 27 issue of THE FACTS newspaper. 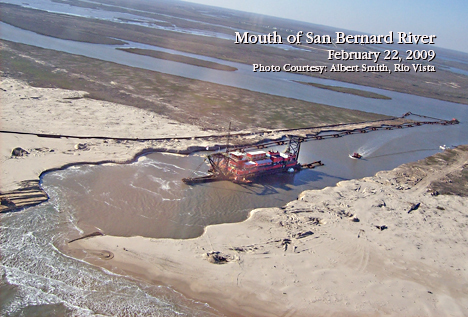 After being closed since December 2012, the possibility of reopening the mouth of the San Bernard to the Gulf looked dismal. Friends of the River San Bernard attended the first meeting of the Gulf Coast Ecosystem Restoration Council in Galveston in June of last year. It was there, FOR learned about the BP Deepwater Horizon oil spill funds that hopefully will be coming to the Texas Gulf Coast. FOR San Bernard thanks the Brazoria County Commissioners for their efforts in supporting reopening the mouth of the San Bernard by unanimously voting to enter into negotiations with Dannenbaum Engineering for the RESTORE Act funded project of dredging open the mouth and building protective jetties. It's exciting news and we look forward to seeing progress on the river! Mar 13 - Mike Goodson, FOR Mouth Committee, met with Dianna Kile of Congressman Randy Weber's office to compile a letter of introduction from FOR to TCEQ Commissioner Toby Baker informing him of our project to reopen the mouth. Jul 11 - Inspection of mouth by restoration engineering team "Work on Reopening the Mouth"
Jan 20 - BP Oil Spill Litigation Phase III of the BP oil spill litigation begins. District Judge Carl Barbier, New Orleans, who oversees litigation related to the BP disaster, will determine how much oil was spilled. The amount would be used to calculate damages. Apr 22 - Environmental Law Institute discusses where we are five years later with restoration and recovery funding from the Deepwater Horizon oil spill. 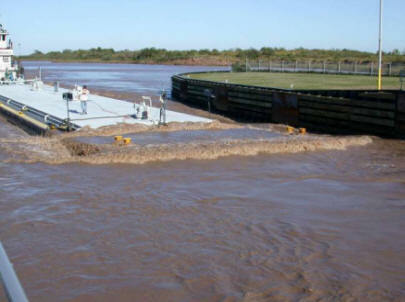 Note: Currently, Dannenbaum Engineering is working on a grant application for RESTORE Act funds to dredge open the mouth and build protective jetties to keep it open. No money has been spent yet on Civil Settlement projects under the RESTORE Act. Sep 2 - "After a comprehensive modeling effort and the available state and federal funds, the county is reviewing a dredge only alternative which would likely cost about $2M initially, with maintenance dredging every 3-5 years." – Susie Alford, President, CEO Berg Oliver and FOR Environmental Committee Consultant. Jan 28 - THE FACTS article "Corps Has Path to River Opening"
Feb 6 - THE FACTS article "Support flows in for San Bernard"
Feb 11 - THE FACTS article "OUR VIEWPOINT: River dredging project worth it if it lasts"
Feb 16 - TYLER MORNING TELEGRAPH article "Focal Point columnist Dave Berry writes about big news from Sweeny, Texas"
Mar 14 - Toby Baker's editorial “From Destruction, Restoration”. He is the Texas Commission on Environmental Quality (TCEQ) commissioner who is overseeing the implementation of the RESTORE Act. Feb 15 - TCEQ Commissioner Toby Baker announces in letter to Rep Dennis Bonnen, a draft list of projects for consideration to receive RESTORE Bucket 1 funds. The "Lower San Bernard River Eco System" project is first on the list. Feb 18 - Brazoria County Commissioner Dude Payne and David Linder announce good news at the FOR State of the River Meeting. Feb 24 - Brazoria County Commissioners Payne and Linder met with regulatory agencies at the mouth to address any issues with any permitting processes. We are definitely headed in right direction. Mar 1 - Spring FOR "Current News" newsletter updates information about reopening the mouth. 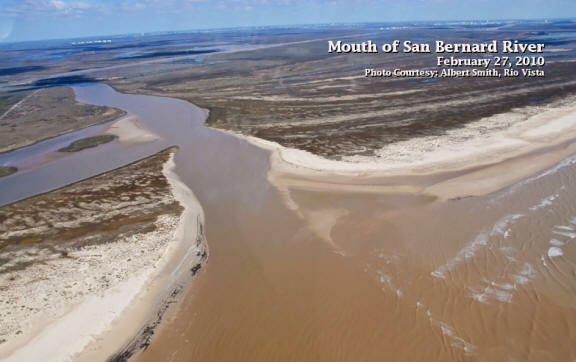 Mar 3 - THE FACTS article "Fed gov't may give funds for San Bernard River project"
Jan 26 - State Representative Bonnen, Commissioner Payne, Commissioner Linder, and project leaders from GLO, TPWD, USFWS, and USACE take investigative boat trip to the mouth. 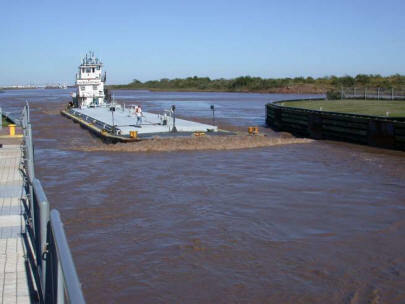 Mar 10 - THE FACTS article "Port Officials Agree to Split Maintenance Dredging Costs"
Mar 27 - Commissioners' Court of Brazoria presented RESOLUTION regarding USACE removal of the Brazos River west floodgate affecting the San Bernard mouth. Apr 17 - Representative Dennis Bonnen, Texas General Land Office Commissioner George P. Bush, Brazoria County Judge Matt Sebesta, Commissioner Dude Payne and Constable David Thacker toured the San Bernard River. Jul 10 - Texas General Land Office Surface Lease Agreement presented at Commissioners' Court of Brazoria County. Aug 4 - Commissioner David Linder announced at the FOR hosted Breakfast on the Bernard, the Texas Commission on Environmental Quality (TCEQ) should get funded to dredge open the mouth by the fourth quarter of this year and unless there are unforeseen events, dredging should start the first part of next year (2019). 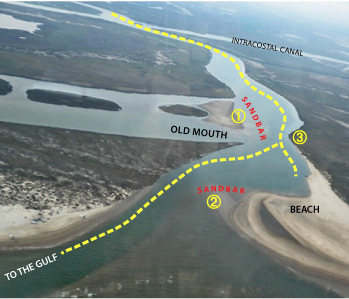 Description of the "Mouth of the San Bernard Restoration Project" - click on diamond project marker for "Mouth of the San Bernard River Restoration Project" and then "open project page' for description, use the "+" sign to enlarge for easier reading. 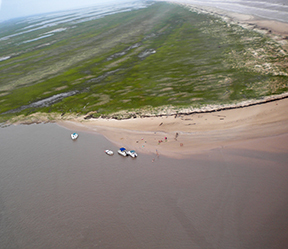 Boaters should proceed with caution and slow speed when in this area due to the shifting conditions of the sand bars. 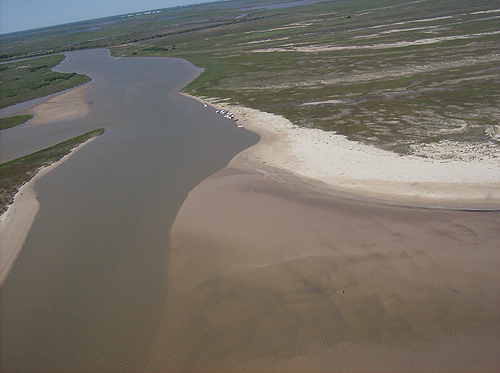 After passing the Intracoastal Canal and heading downriver towards the Gulf, a sandbar (1) has formed on the west side, just before the opening into the old river mouth. Boaters should stay to the east side of the channel. A sandbar (2) has formed in the middle of the channel heading out to the gulf. Boaters should to be close to the west bank heading out to the gulf. Note: currently that channel is too shallow to handle boat traffic. If you are going to the beach on the Freeport (east) side, stay close to that last point (3) that sticks out a bit on the east side, then slow down and stay left of middle in the channel. of sunken shrimp boat lies to the right of arrow. Seas were very calm and the tide was abnormally low (about two feet below normal). The channel went almost straight out and registered 5.5 to 6.5 feet deep until we passed the beach line. Then there was a sand bar and the water never measured less than 3.5 feet deep. Passing the bar, it rapidly dropped off to 11 feet. Bottom line (so to speak), the recent flood significantly improved the accessibility to the Gulf from the San Bernard for small boats. 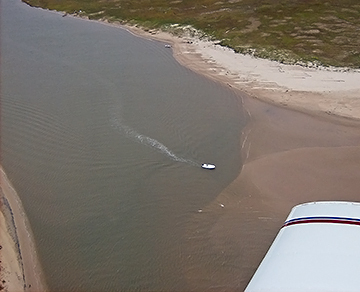 Later in the day, the seas picked up, but boats, both small and off-shore types, were able to travel in and out the mouth without any noticeable problems. 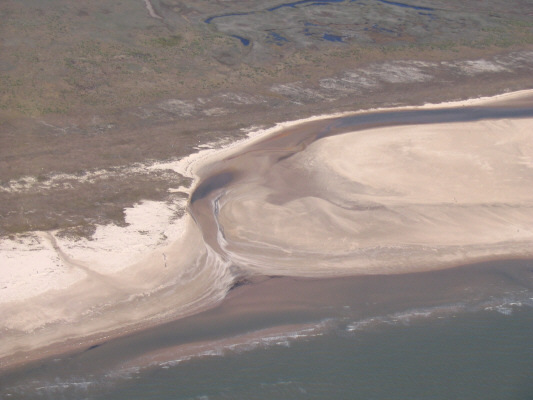 April 25, 2010: Mouth of the San Bernard, sand bar is forming on east side. March 12, 2010: The mouth is not migrating west, but has mainly reoriented. 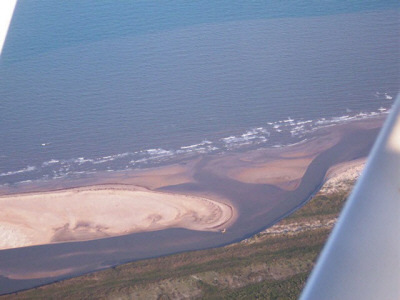 Area where the ebb-tidal shoal is attaching to the shore on the west side, allowing sand to bypass naturally. Large amount of material has filled into the old migrated outlet. 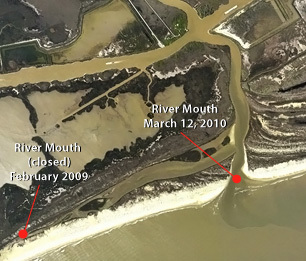 February 27, 2010: A year after being dredged open, sand bar is forming on east side of the mouth opening. 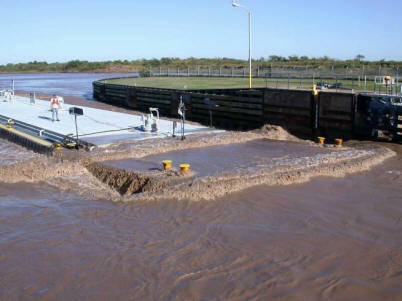 February 22, 2009: Dredge at work, mouth almost open. 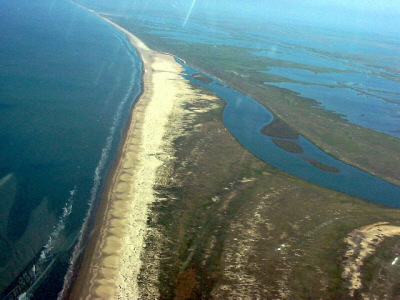 In January 2006, the mouth of the San Bernard River was closed by a ridge of sand built up by currents from the Brazos River mouth. 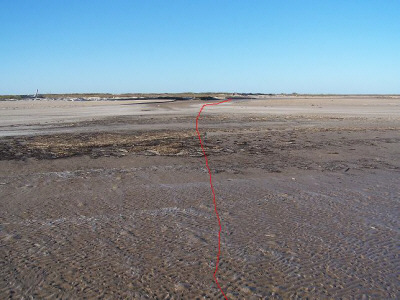 The sandbar had completely stopped the flow of water to and from the Gulf. 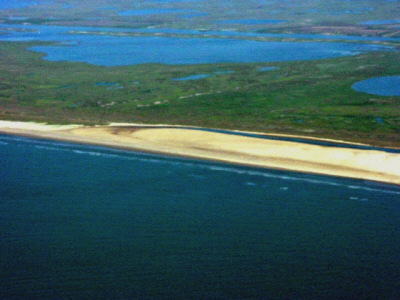 A walk of 300 yards on sand was needed to reach the Gulf. Water flowing down the river turned east into the Intracoastal Canal. 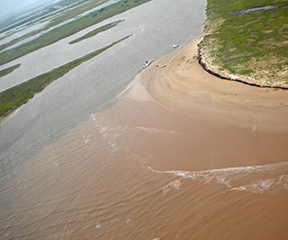 According to the Corps of Engineers, the build-up of the sandbar was caused by the Corps moving the mouth of the Brazos River to a point above and closer to the San Bernard mouth in 1929 to accommodate the Port of Freeport. 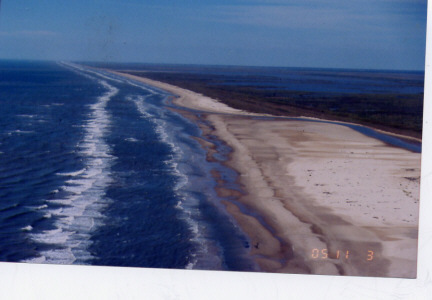 Because of the closed river mouth, currents of up to 15 knots would build up on the west end of the Brazos River floodgates on the Gulf Intracoastal Waterway, some 4 miles east of the San Bernard River. 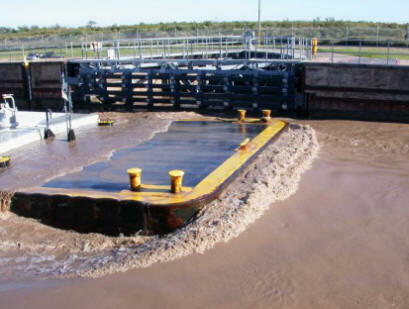 This caused severe navigational problems of tow barges who would have to push through the current on their way westward, striking the flood gate in many cases. 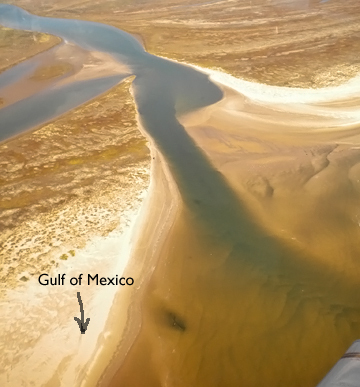 On January 13, 2009, the Corps of Engineers awarded a $2.4 contract to dredge an opening to the Gulf, 10 feet deep by 100 feet wide. 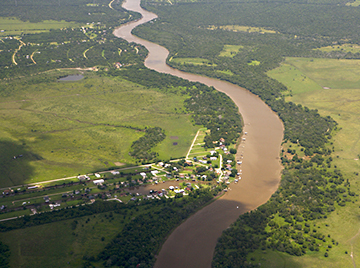 The opening is not navigable for boating to the Gulf because of its varying depth but rather serves to relive the pressure of current on the Brazos River floodgates. Do not swim or wade in this area due to the strong tidal currents. 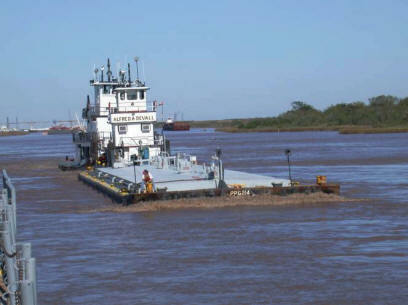 Barge, westbound, entering east gate entrance of Brazos River East Flood Gate on Intracoastal Waterway. 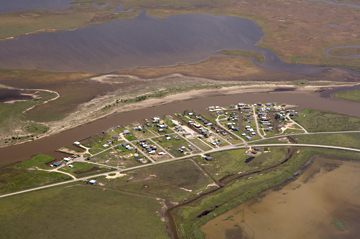 The USACE report stated that the mouth of the San Bernard River was traditionally maintained at 1,100 feet wide by 8 1/2 feet deep, until 1990. In reality, the mouth was 6,000 feet SW of its original location and was 200' wide by 4' deep. 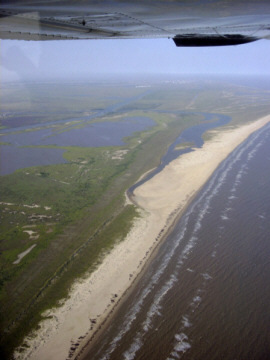 At this level, there is no flow from the San Bernard River going into the Gulf of Mexico. 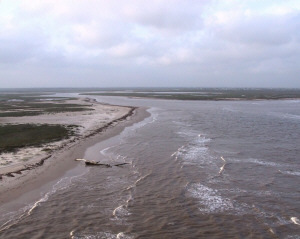 The river is no longer capable of exiting through its traditional mouth into the Gulf. 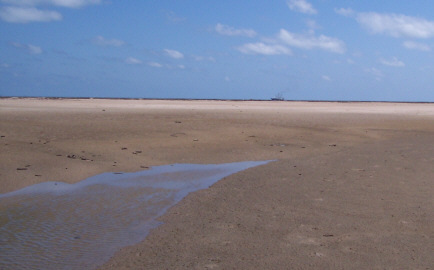 A sandbar blocks the entrance to the Gulf. You can walk across the mouth. 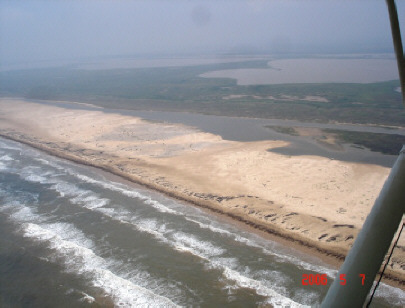 Nov 2005: A huge beach is in front of the river which necks down. It shows the islands in the river and the tiny river mouth. 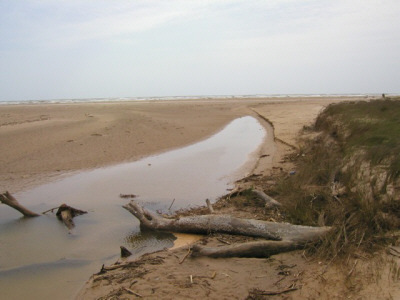 Down the beach - that's the cut in the fourth Cedar Lake. It is much bigger than the river mouth? The mouth is closed. No flow to the Gulf of Mexico. 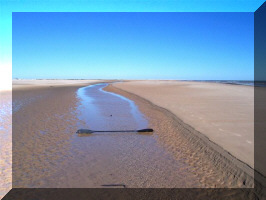 The kayak paddle across the mouth of the river for scale is 7 feet, 7 inches long. The aerial photo also shows the mouth completely closed...not a trickle goes out the mouth. Soon, we won't even know where the mouth used to be. 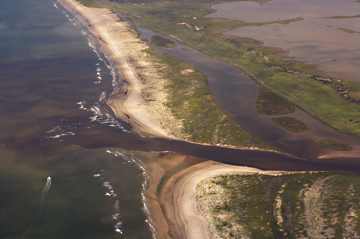 You can see the dead end of the mouth in the first stream to the right of the Gulf. The mouth dead ends far short of the Gulf. You can barely see the boat in the Gulf on the horizon. Dr. Watson has given us permission to link to them on the web and to use them in presentations, with credit.